Just days after I-T officials conducted a raid at actor-turned-politician Sarath Kumar’s residence, the department searched properties linked to his wife Radhika Sarathkumar’s Radaan Media network on Tuesday. The celebrity couples’ residence was raided on April 7 as part of a widespread crackdown to check use of money power in the RK Nagar by poll.The actor is one of the supporters of Sasikala, who is now serving the jail term.The Income Tax department had also raided multiple properties of Health Minister C Vijayabaskar, including his residence. Only last night the Samathuva Makkal Katchi leader Sarath Kumar announced his support for TTV Dinakaran in the upcoming RK Nagar byelections and as if on clue there have been raids on his properties since this morning by the IT department. 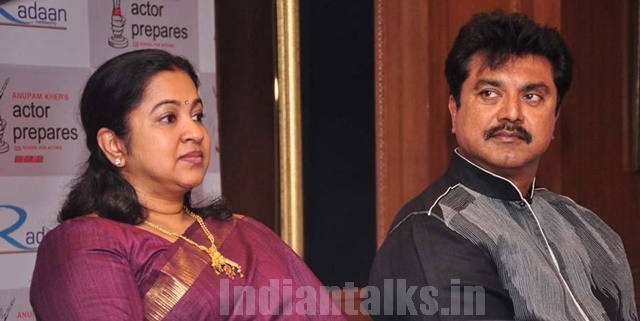 The Coples Radhika and Sarath Kumar have blamed the central government and said the Income Tax raids are just to prevent them from campaigning for TTV Dinakaran. SarathKumar added that he has given his full cooperation to the officials and also quipped that they will find nothing and may have to give him something. The Reports suggest that the Income Tax department had also raided many other Tamil Nadu VVIPs. IT department had earlier raided on multiple properties of Health Minister C Vijayabaskar, including his residence. The IT Raids also happen on former MP C Rajendran and VC of MGR Medical University, Dr. Geethalakshmi. The Sources in the I-T department told News channels that on April 7, in all 32 locations in the state, including 21 in Chennai, were raided.